R. Paul Michael, AKA SURJ, is a Colorado native. Born and raised. He spent his 20’s in Los Angeles, focusing on Film, and all things creative. It was Los Angeles where he fell in love w/ Street Art (as so many names and incredible works adorn the walls of the cityscape.) SURJ has always been an artist but began putting his true energy and passion exclusively into painting (chiefly Street/Pop Art) in 2014. He uses aerosol and acrylic paint mainly as his mediums (and weapons) of choice. But he does not limit himself to one medium. He thrives on modern and contemporary art that pays homage to those who came before him. Being versed in graphic design work, it was a very natural progression to take his work to the canvas. Although he loves doing large canvases (typically 4 FT on average), his passion lies in the streets. 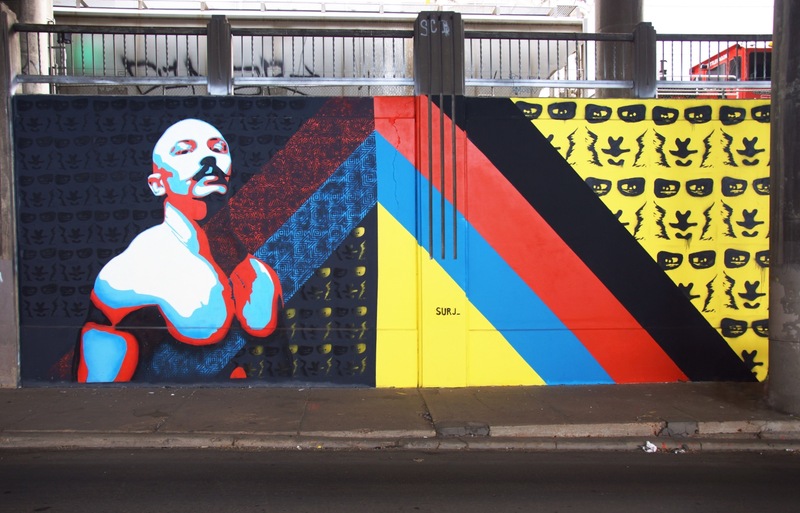 For SURJ, “There is no better way to express your creativity than by affecting the cityscape while staying true to your style an passion.” His city “street works” can be seen in Denver, on Colfax (in front of the Ogden Theater), among other local places. He has a 40 ft. Mural on the south side of 46th between Brighton Blvd. & York, underneath Interstate 70, accompanied by several other artists, as part of a very unique urban project,’Duct Work”. SURJ does what he wants when it comes to painting, but is open to commissions: “I love to paint, and I’m happy to provide a HIGH-quality piece to anyone interested . . .. So long as I have the lion’s share of artistic freedom.” Please enjoy the site.